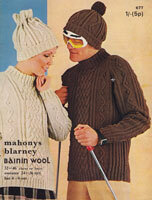 Mahonys 644: Great vintage knitting pattern for ARAN jumper for him and her. This design has trinity stitch as well as complex cables and links, nice deep welt and cuffs with crew neck. To fit 34-36, 38-40 and 42-44 inch chest. Rich traditional stitches for warmth and style. Always work a tension square. 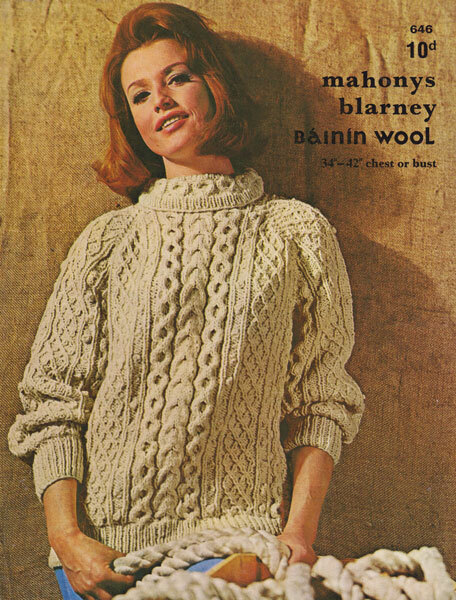 Mahonys 646: Fabulous Aran knitting pattern for ladies jumer. This super pattern is for a chunky, crisp aran jumper with lovely crunchy cables and bobbles, trellis and ribs with super collar - great for the coming chilly weather. To fit 34/38 and 40/42. 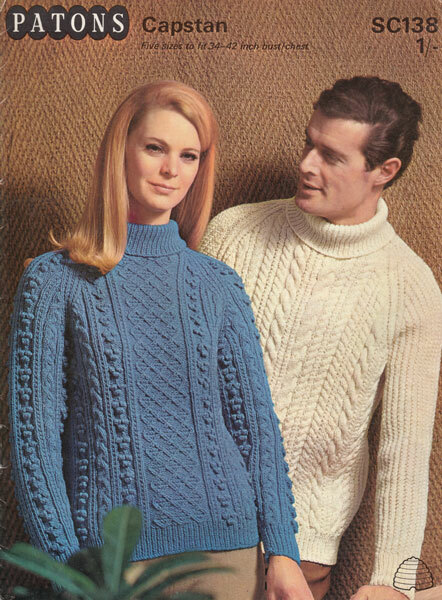 The finished jumper will be larger than these sizes on purpose. It takes between 30 and 34 ozs and is knitting on large needles. 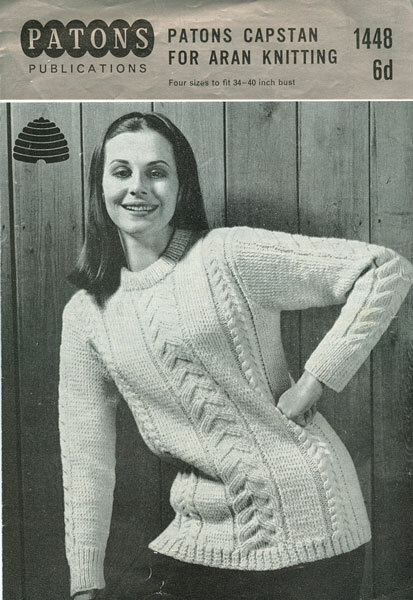 The pattern referes to 3ply Bainin, which was a triple knit or Aran weight. 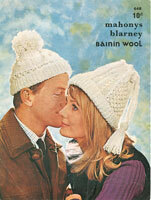 Mahonys 648: Great vintage knitting pattern for two styled of aran pull on hat for him and her. To fit average adult head from 1960's. Pattern in great condition. Fabulous knitted in ALPACA. Mahonys 652: Great vintage aran knitting pattern in classic Irish designs. This one uses easy cable stitches to create a lovely timeless cardigan with collar or with out. Knitted Aran yarn, the pattern says 3ply Bainin, dont be put off by this, use ordinary Aran weight wool and work a tension square to see if you need to change needles to get the correct size as modern aran yarns are not always as thick as the vintage ones. Sizes 34"-42", but knit up a little larger so they can be worn over other jumpers. The largest size will work out at about 45" Bust and the smallest about 36". Mahonys 659CA: Great vintage ladies and childs aran sweater knitting pattern. To fit 28-34 inch chest/bust and knitted in and aran wool. A chain cable panel and double moss stitch make a great classic, but retro look. High neck or roll collar which ever you like. Always work a tension square. Mahonys 677: Great vintage ladies and mens aran sweater and hat. 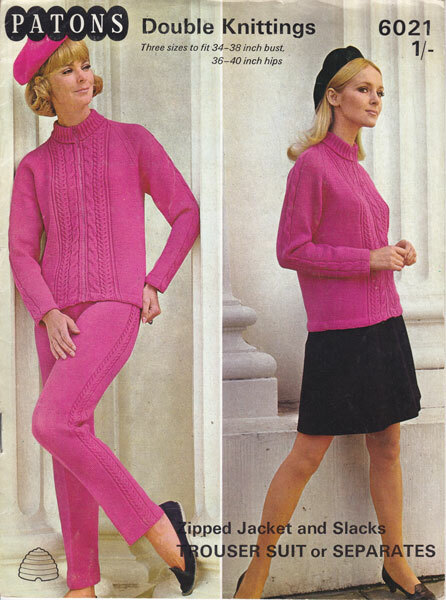 This is a super pattern with instructions for high neck sweater and two differnt style hats. Jumpers to fit 32-46 inch bust/chest in 6 sizes. Always work a tension square. 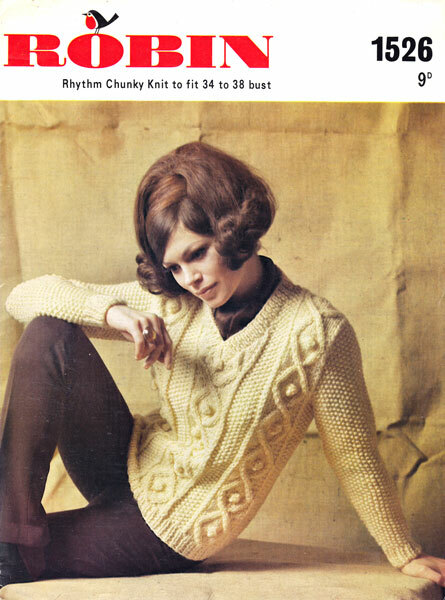 Marriner 986: Great vintage ladies V neck raglan sweater with cables. There are instructions for 36 and 38 inch bust and double knitting is used for this one. Always work a tension square and change needles if needed to get the tension correct. 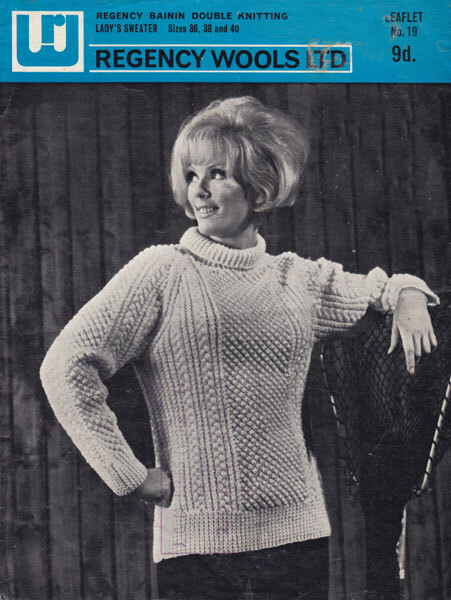 Marriner 1088: Great vintage Aran style jumper and leggings knitting pattern. This set is worked in double knitting with plenty of cables and trellis Aran stitches. To fit 34 and 36 inch bust and leggings waist 25 and 26.5 inches. The Leggings have two zips at a side opening each side to make them fit snuggly. Always work a tension square, knitted in double knitting to give warmth without bulk. 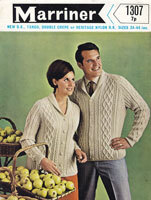 Marriner 1307: Great vintage ladies mens aran shawl collar cardigan knitting pattern. This one is worked in double knitting wool for less bulk, it has interesting but not too complex cables with very retro shalw collar. To fit 34-44 inch chest/bust. 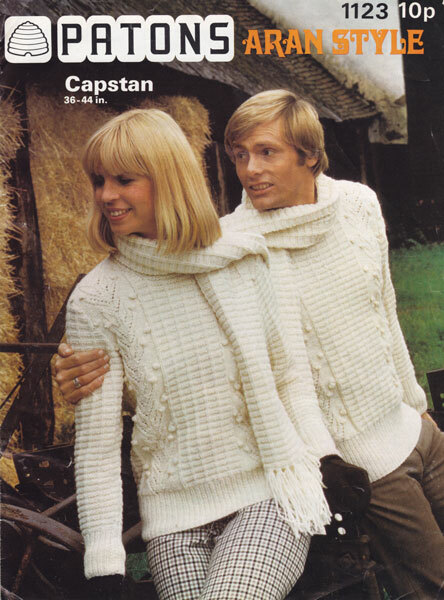 Marriner 1308: Great vintage ladies and mens aran polo neck jumpers. This pattern is for a lovely thick aran sweater, knitted on 5 and 8 (5.5mm and 4mm) needles so try a thick aran or chunky that knits well on these needles. Always work a tension square. 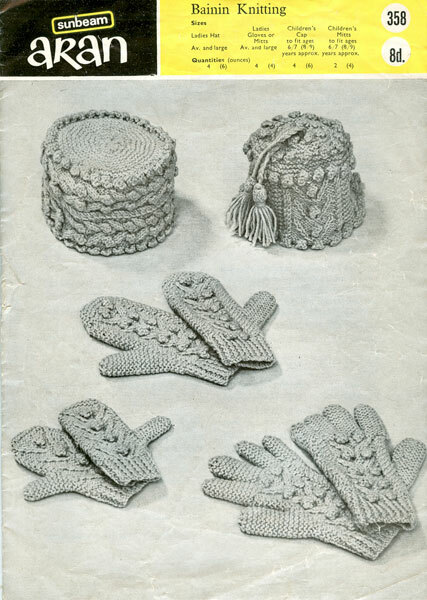 These designs can always used on other patterns, it is good to have a selection for Aran designs if you like working with cables, plaits, bobbles and panels. It is quite easy to work them into the stitches that you need to make the garment. 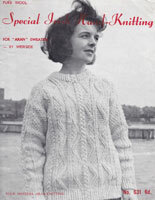 Marriner 1309: Great vintage ladies aran style jumper knitting pattern. 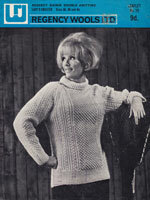 This pattern has instructions to knit this super jumper in double knitting so not too bulky, in sizes 33-37 inch bust. Always work a tension square and change needles if needed to get the correct size. Takes 21oz (13 x 50g balls). 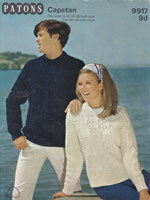 Patons SC138: Great vintage ladies and men's polo neck jumpers in thick double knitting wool from 1960s. 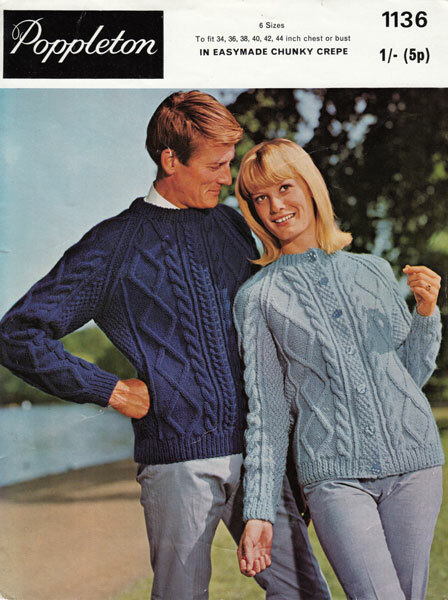 This pattern has two designs and crisp cable with ropes of all descriptions for him and a neat polo with treliss, cables and bobbles for her. To fit 34, 36 and 38 inch bust and38, 40 and 42 inch chest. Always work a tension square. 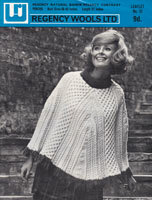 Patons 1123: Great vintage knitting pattern for aran style jumper with bobbles and leaf panel, with scarf to match. 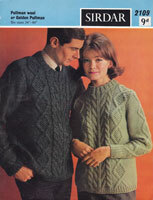 This pattern has instructions for a jumper to fit 36-44 bust/chest and is suitable for both him and her. This Capstan pattern is for a yarn that was thicker than modern double knitting and nearer to Aran so try a tension square in the yarn chosen and and change needles if needed to get a good tension. Capstan was refered to as a rugged sports yarn! 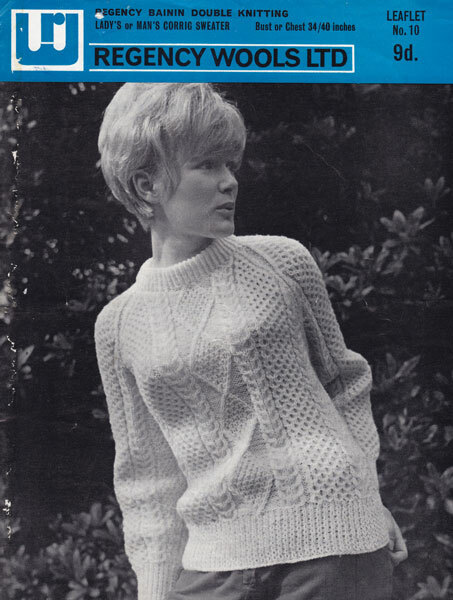 Patons 1448L: Vintage knitting pattern for aran jumper to fit 34"-40" bust. Knitted in aran wool, nice long line style great with skinny jeans, jeggins, or leggings this cold winter. 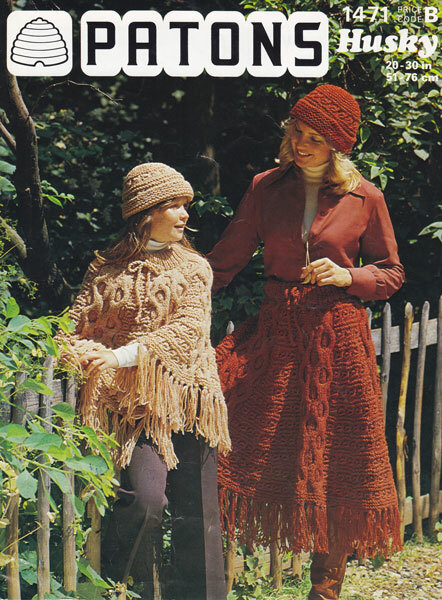 Patons 1471:Fabulous vintage ladies aran knitting pattern poncho skirt hat 1977. What a great pattern! There are instructions for the fabulous fringed poncho, or wear as a skirt and pull on hat in a great range of sizes for mother and daughter. To fit waist 20-22 inches, 24-26 inches 28-30 inches. length optional but given between 22-28 inches. Hat in two sizes average child 10-14 and adult. Great for a retro look this autumn. Patons 6021: How pretty is this? 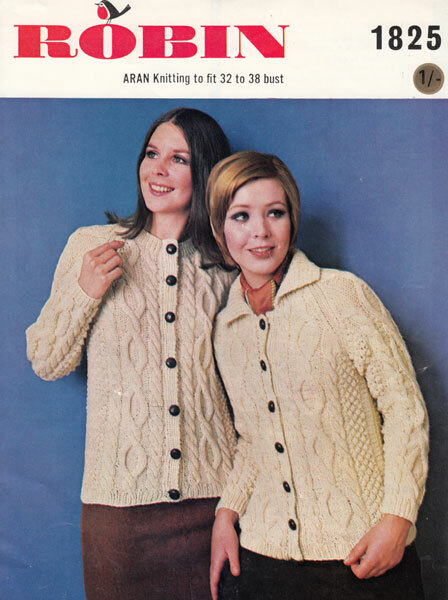 Great vintage knitting pattern in double knitting with aran design. Jacket has a zip, so easy to put in, or could be knitted as a jumper, or edge to edge jacket. Slim leg trousers look so elegant. 34"-38" bust, trousers to fit 36"-40" hip leg length adjustable from the late 1960's. Look smart this spring, turn heads with this trendy look! 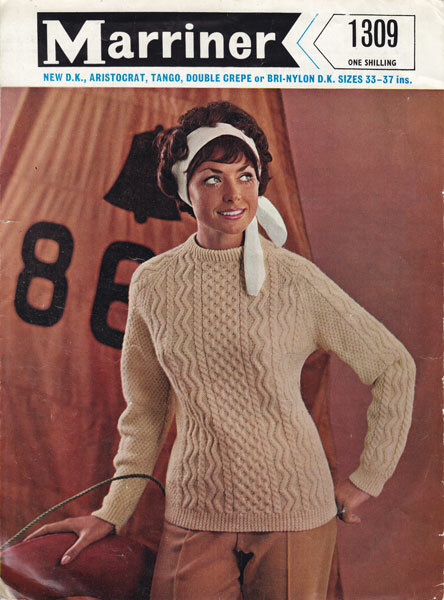 Patons 6060:Great vintage ladies aran polo sweater knitting pattern. Simple saddles shoulder style with slash pockets and deep polo collar. This design has a slimming effect as the cables are fine and wide a part. Always work a tension square. 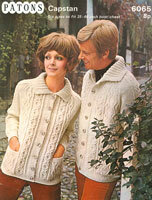 Patons 6065: Vintage ladies and man's Aran knitting pattern, a great jacket for him or her from in aran weight wool. Classic style and design. To fit 35"-46" bust/chest. 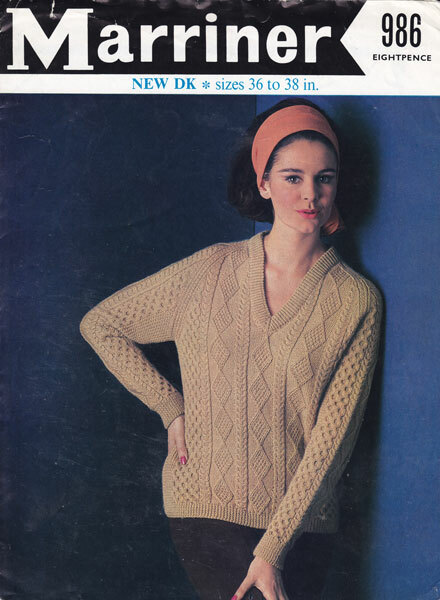 Patons 6343: Lovely vintage knitting pattern for aran jumper to fit 34"-40" bust/chest, double knitting, always work a tension square as all double knitting yarns knit differently. 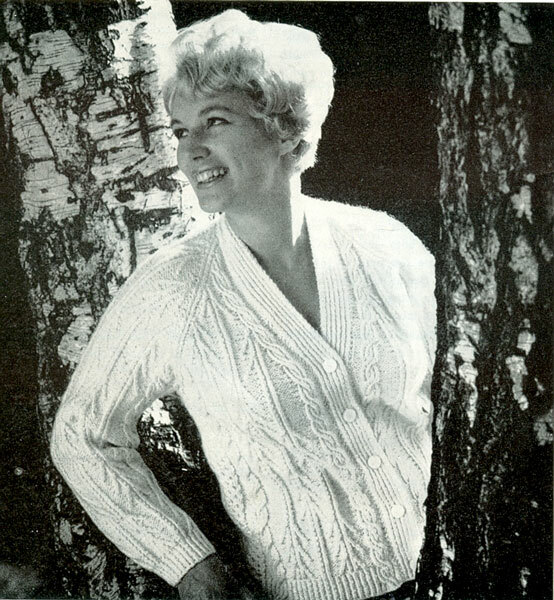 Patons 9344: Fabulous vintage Aran style cardigan vintage knitting pattern 1960s. I love this patterns as it has all the classic appeal of the aran cables, but in a slim fit design, no bulkiness. Always work a tension square to make sure the garment will fit when completed. Not sure what ply Flair was now, long time ago! But it is knitted on old 9s and 7s which makes me think it is similar to modern aran, a bit thicker than double knitting. To fit 34, 36 nd 38 inch bust. Patons 9917: Great vintage crew neck sweater in Aran 1960s. This super scrunchy cable design to fit 34-36 and 40-42 is so right for those sailing days of summer, when the wind is a bit chilly. Always work a tension square. Super wave cables with bobbles and ridge panels. 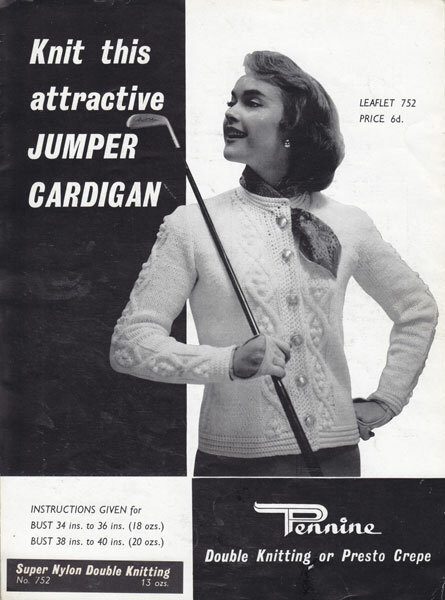 Pennine 752: Great vintage knitting pattern for ladies cardigan 1950s. This one is great for golf or other outdoor activities. To fit 34-36 and 38-40 inch bust and has a cable panel up each sleeve and up the front, with a plain back. Knitted in double knitting on large needles, so aran ply might work better. Always work a tension square. 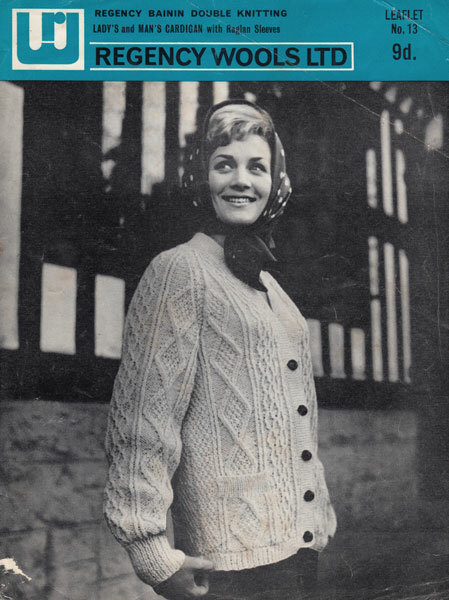 Pennine 770: Great vintage ladies cable cardigan knitting pattern 1950s. This lovely pattern is worked in a double knitting that knits to a tension of 6 stitches to an inch on size 6 imperial or 5mm needles. So you might find that Aran ply is better. To fit 34-36 and 38-40 inch bust. Always work a tension square. 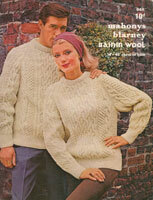 Poppletons 1136: Great vintage ladies and men's aran style jumper knitting pattern. This pattern is worked in a chunky wool and is to fit 34, 36, 38, 40, 42 and 44 inch chest or bust. 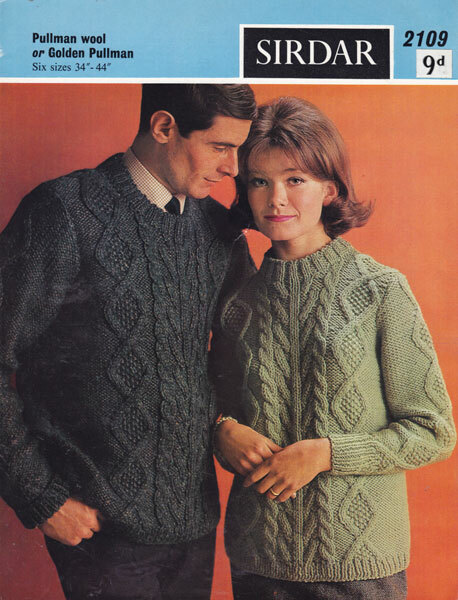 There are instructions for a cardigan and a jumper. Cables, double moss and diamond and antler (could be the lobster claw under another name) pattern. Always work a tension square. 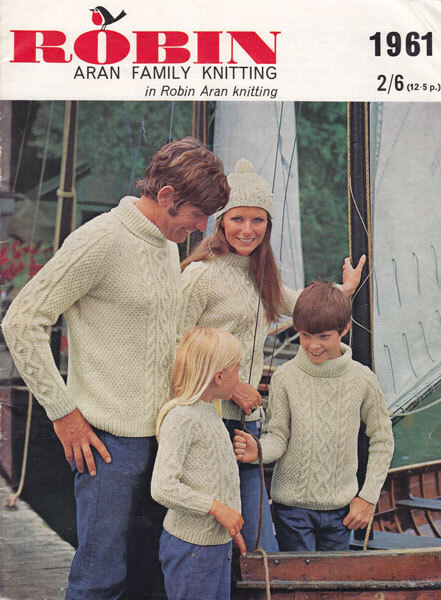 Regency Book 2: Great vintage Aran knitting patterns for all the family, from Ireland, great pictures of Ireland sites and places as well as a great seection of patterns. There is a small library of 12 classic stitch patterns that are used in the book and there are 13 different patterns., including those as shown below. Book is worn at edges, with scuffs but clean and sound, 44 pages. 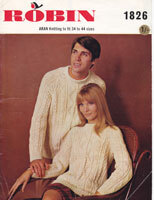 Regency 10: Great vintage ladies aran style jumper knitting pattern. This lovely jumper is of the corrig design and is knitted in double knitting yarn so is less bulky than some aran style patterns. Worked with authentic Irish stitches, double moss, link, and honeycomb, this pattern is suitable for men or women, there are instructions for34-40 inch bust/chest. Regency 12: Great vintage ladies aran style jacket knitting pattern. This ladies jacke is called Cong, and is in double knitting yarn, the pattern is for 36 bust, but can be increased or decrease by adding or having less stitches on the double moss stitch borders - tension is 6stitches to the inch, so you just add or subrtact the numer of stitches that corresponds to the number of inches you need to add or subract. Double moss, honeycomb, spoon stitch are used in this one. Regency 13: Great vintage ARAN ladies and men's cardigan knitting pattern. There are traditional stitches used in this design, trellis, diamond with fine fisherman's rope cable and double moss stitch. To fit 36, 38, 40 and 42 inch bust/chest. 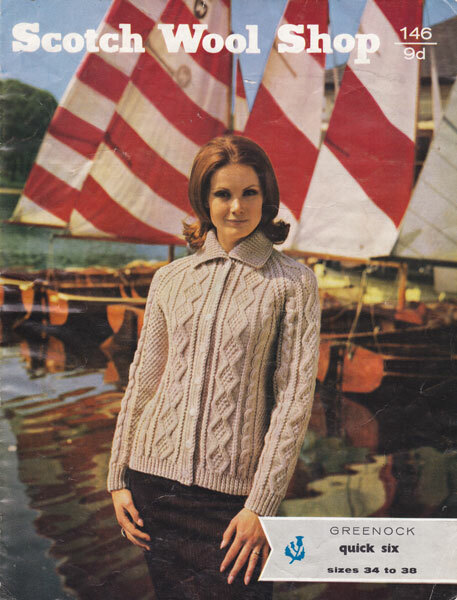 Regency 14: Great vintage ARAN knitting pattern for ladies jacket. This is so traditonal, smart, crisp design with fishermans rope cables, honeycomb and lobster claw stitches are used. To fit 36. 38 and 40 inch bust. 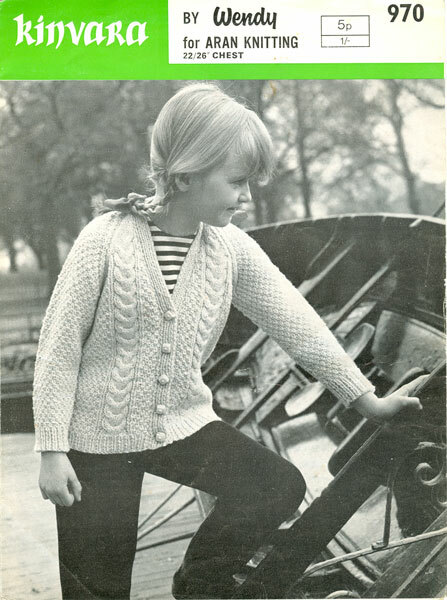 Regency 15: Great vintage cardigan and jumper knitting pattern in ARAN for Child. This one had instructions for sizes 24, 26, 28, 30, and 32 inch chest. With links and cables with double moss and honeycomb stitches giving a crisp traditional styling. Regency 19: Great vintage ladies double knitting pattern for jumper. This pattern has instructions for a roll neck aran with Blackberry stitch panels and plaited cables to fit 36, 38 and 40 inch bust. Knitted in Aran style but in Bainin Double knitting which is slightly thicker than modern double knitting, nearer modern aran, so try both in a tension square and see which gives better tension. Always work a tension square and change needles if needed. 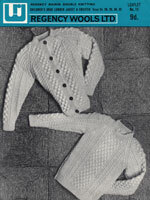 Regency 21: Great vintage ladies ARAN knitting pattern for jacket and cardigan. Classic design and tradition stitches are used. This pattern is to fit 36, 38 and 40 inch bust and is knitted in ARAN yarn. 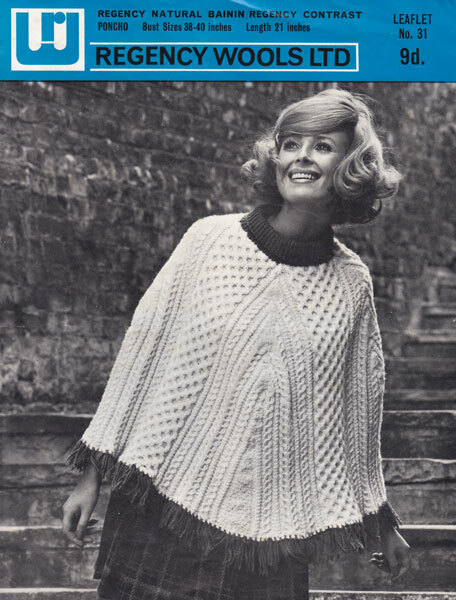 Regency 31: Lovely vintage knitting pattern for Aran poncho with rib neck and fringe to fit bust size 38-40 length 21" (can be made longer or shorter. Knitted in Bainin - tension 5.5 stitches to 1" on size 8 (4mm) needles. Always knit a tension square. 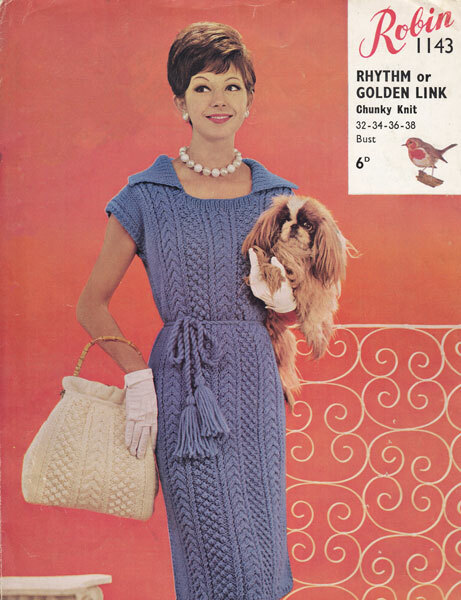 Robin 1143: Fabulous vintage ladies aran dress knitting pattern 1950s matching handbag, the wool used for the design is similar to modern aran, always work a tensions square to check if you need to change needles. This design takes between 21 and 23 x 2oz balls, remember that 2oz is the same as 60g, but always allow an extra ball or two just in case the modern wool knts slightly differnt,you can always knit a pair of mittens or a pull on hat for some one for Christmas if it is not needed. 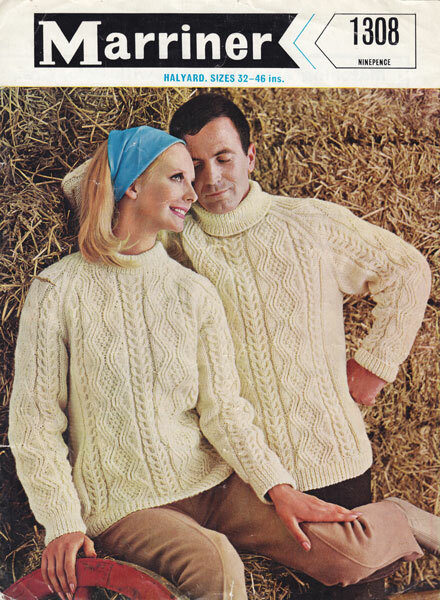 Robin 1526: Lovely vintage ladies Aran jumper knitting pattern. This one is worked in a chunky wool. As there are several thickness of chunky now a days, work a tension square and change needles to get the size required. Looks like it would be thicker than Aran, but not as thick as super chunky. Worked on old sizs 3 and 5 (6.5mm and 5.5mm) and the tension is 7stitches and 11 rows over 2 inches of moss stitch on the 3's. Lovely chunky diamonds and bobbles, snug and warm for the winter months. 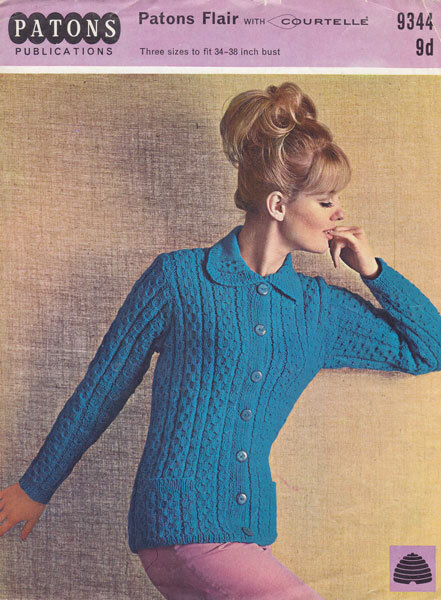 Robin 1825: Great vintage ladies cardigan and jacket in cable knitting pattern. This lovely cable and twist design is classic Another traditiona knit. Aran. 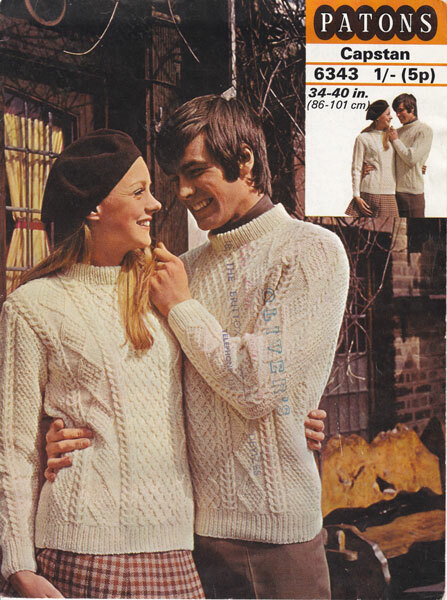 Knitted in ARAN yarn and to fit 32, 34, 36. 38 inch bust. Raglan sleeves with our with out collar. Robin 1826: Great vintage aran jumper knitting pattern men or ladies. This pattern is in 34-44 inch bust/chest and knitted in aran wool with intersting rope cable down front. Takes between 12 to 15 x 2oz balls. A 2oz ball is the same as 60g. Always knit a tension square. Robin 1945: Great vintage ladies aran cardigan coat knitting pattern. This pattern is for a jacket and a coat with colour, to fit 34-38 inch bust, the coat is 35-36 inches long, but this can be made longer, but don't forget to add extra wool if you do this. The coat takes between 15 and 18 2oz balls and the jacket takes 11-13 x 2oz balls (2oz is the same as 60g) Always work a tension square to see if you need to change needles. 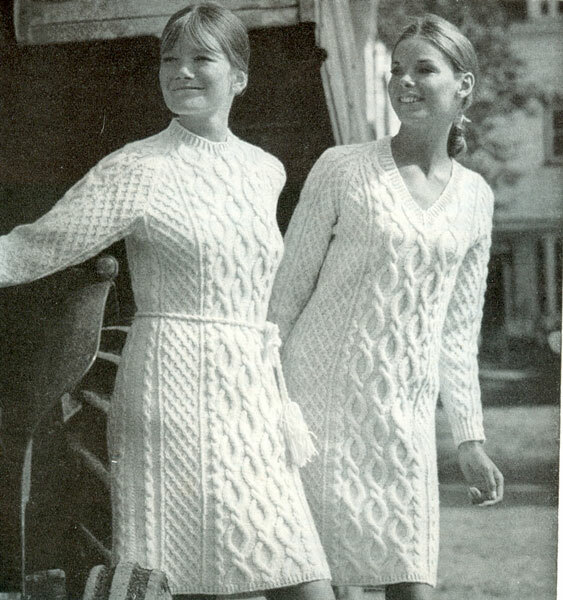 Robin 1946: Great vintage ladies Aran dress knitting pattern. This is a lovely design for a warm, but flattering aran dress with cables and bobble design and a V neck and long sleeves, could be made shorted for tunic or jumper, sleeveless for a slip over, lots of options for this one.Always work a tension square. To fit 34, 36, and 38 inch bust. 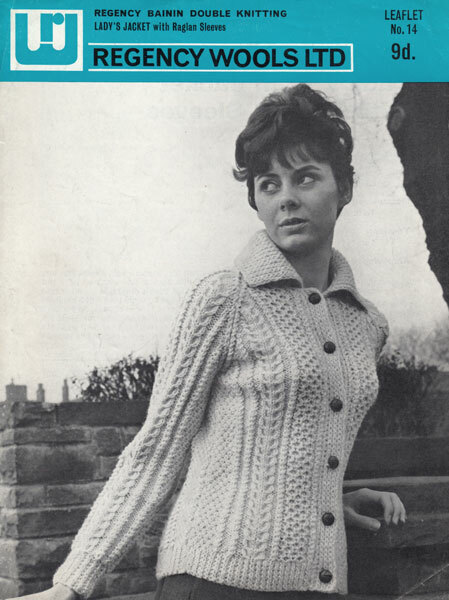 Robin 1961: Great selection of knits in this vintage Aran knitting pattern book. Jumpers and sweaters for all the family 20. 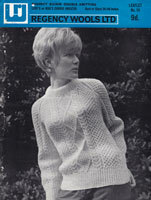 The cover pattern is for crew or polo neck sweaters to fit 24"-44" chest/bust knitted in Aran wool. see be low for some of the designs from this book. 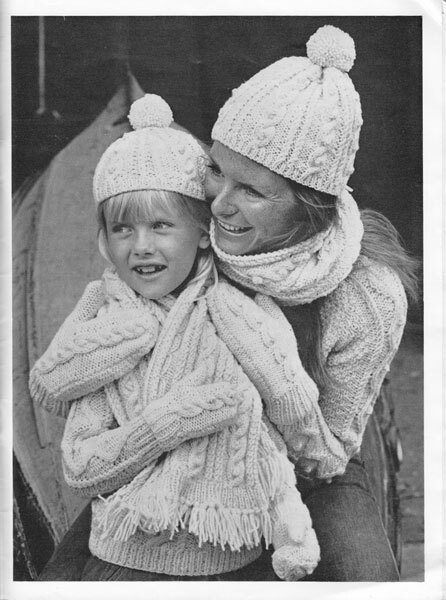 Robin 1961-14: Hat, scarf and mitts in Aran for adult and child knitting pattern. Hat measures 16", 19", 22" round head, scarf length 34"-46" adjustable and the mitts measure 5.5, 6.5 and 7.5 round hand - look great with cosy aran sweaters on a chilly day. 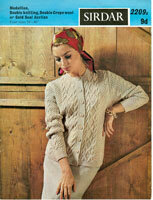 Scotchwool 146 (Greenock): Great vintage knitting aran pattern for ladies jacket. Pretty diamond and cable design with collar. To fit bust 34, 36 and 38 inches. Knitted in quick six which is no longer available but similar to Aran in ply. Always work a tenstion square and change needles if needed. 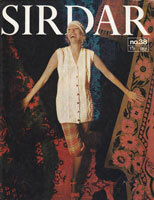 Sirdar Family Aran Book: A lovely book with 7 designs, some opf which are listed below as seperate patterns. . 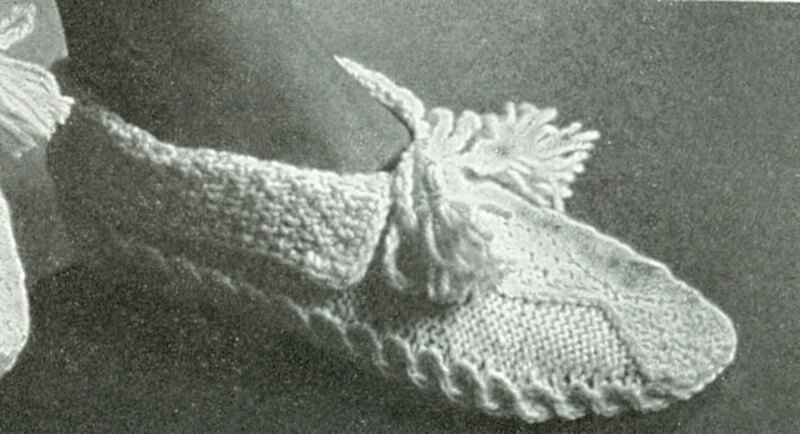 The patterns included are Childs cadigan, childs hooded jacket, childs aran cap, aran slippers (see below) Sweater dress, ragalan cardigan for the fuller figure and two different desigs for adult sweaters. Sa17: Slippers in double knitting (4 needles needed) to fit 9.5 inch foot (adjustable) from the book above. 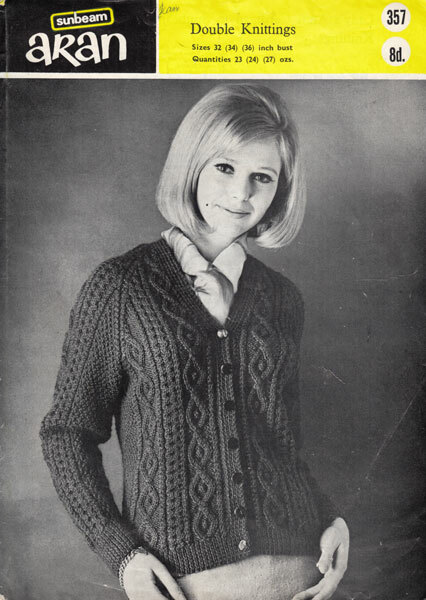 Sa32: Great vintage ladies aran style knitting pattern for V neck cardigan. For the fuller figure, this one is slimming and warm, knitted in double knitting with an unusual vine patterns 38"-44" bust. 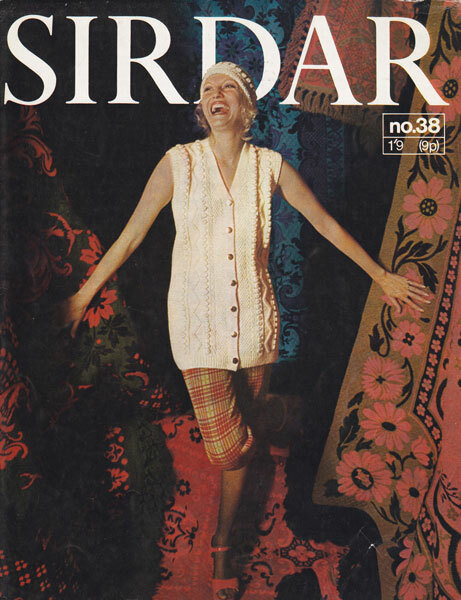 Sirdar 38: Great vintage retro aran knitting pattern ladies long waistcoat. This lovely pattern is so typical of the time, knitted in double knitting wool so less bulk but still has splendid crisp cables. To fit 34-36 inch bust, finished size 36-38 inches. There are instructions for the long sleeveless jacket and the beret. Nice and easy, quick to knit. 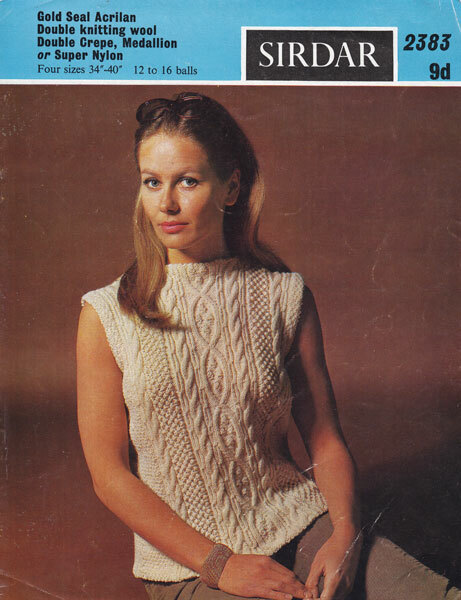 Sirdar 2045: Great vintage knitting pattern for a fuller figure. Pretty cardigan with cable panels knitted in double knitting, so not as bulky as an aran cardigan, to fit 40"-48" bust. In five sizes. 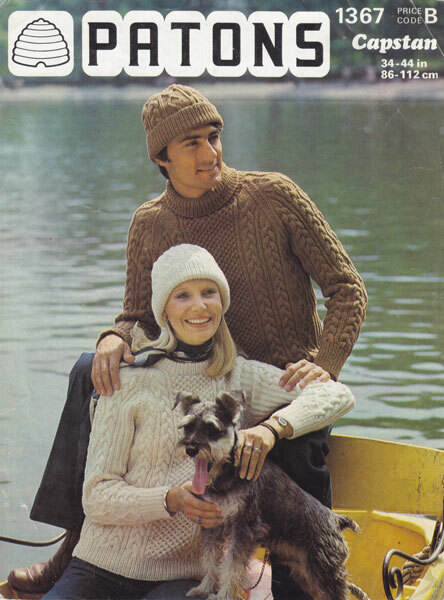 Sirdar 2109: Great vintage men's and ladies Aran jumper knitting pattern. 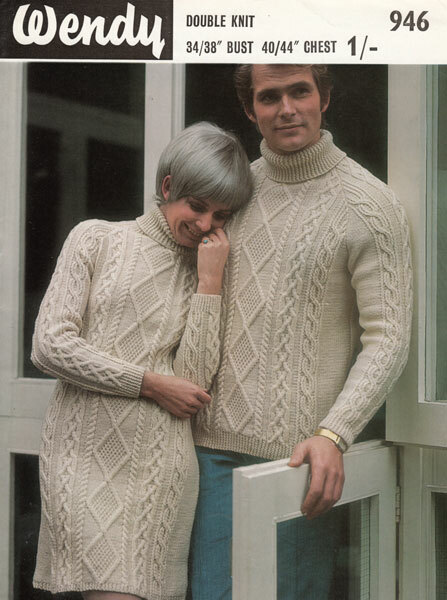 This Pattern has diamonds, cables in Aran wool to fit 34-44 inch chest/bust in 6 sizes. Always work a tension square. Sirdar 2209: Great vintage aran cardigan knitting pattern for an elegant lady. Knitted in double knitting, 34"-40" bust. Super Aran style design. Always work a tension square and change needles if needed. 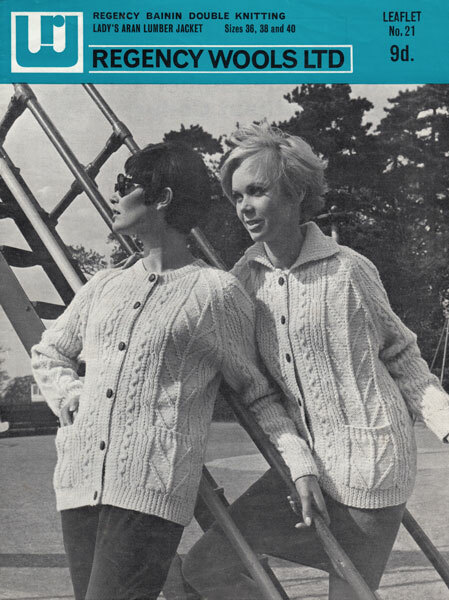 Sirdar 2258: Great vintage ladies cardigan knitting pattern in aran style 1960s. This pattern is in fact worked in vintage 4ply, and seeing the needles size should work out okay in modern 4ply. Always work a tension square. I put it in here as it has a rather nice trellis cable. To fit 34, 36, 38 and 40 inch chest working about about 2 inches bigger when finished. 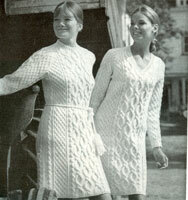 Sirdar 2383: Great vintage ladies aran style top. This lovely pattern with deep crisp cables is knitted in double knitting to give less bulk but the look of aran. To fit 34-40 inches. This one takes between 13 and 16 x1oz balls (1oz is similar to 30g) always work a tension square. 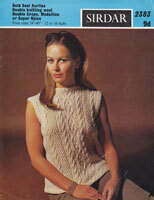 Sirdar 2456: Great vintage aran knitting pattern for ladies dress to fit 34-38 inch bust and 36-40 inch hips. Worked in double knitting so not too bulky, but still warm and stylish for the winter months. Suggests between 32 and 36 1oz balls of wool ( approx 20-22 50g balls) Always work a tension square. 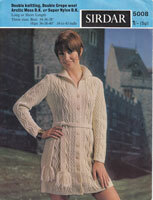 Sirdar 5008: Fabulous aran knitting pattern for classic coat-dress. Knitted in double knitting wool to fit 34-38 inch bust and 36-40 hips. Balls refer to 1oz balls - approx 30g. Always work a tension square. 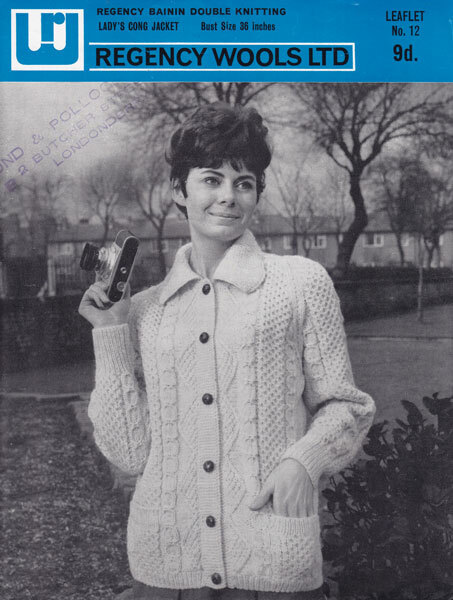 Sirdar 6152: Fabulous vintage knitting pattern for a flared coat. 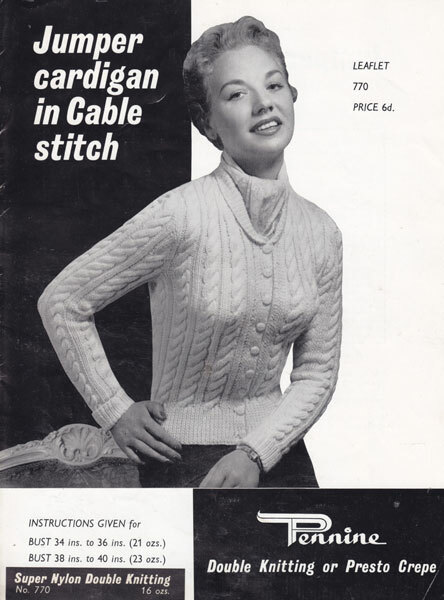 Stunning design with big collar, raglan sleeves and diamond and rope cables. To fit 34, 36 and 38 inch bust. Knitted in aran, but needles suggest it might be nearer double knitting, always work a tension square. 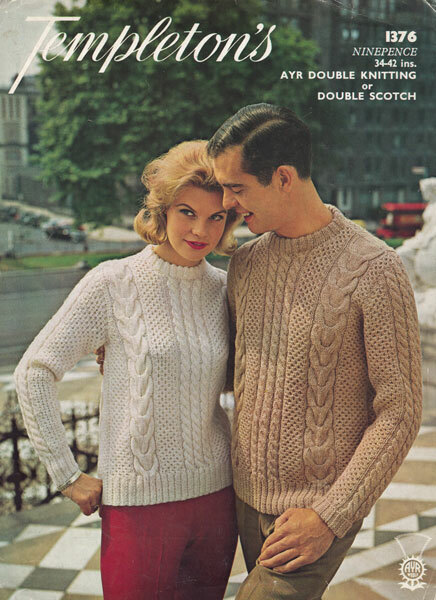 Sirdar 7795: Great vintage ladies and men's double knitting pattern aran style jumper 1960s. 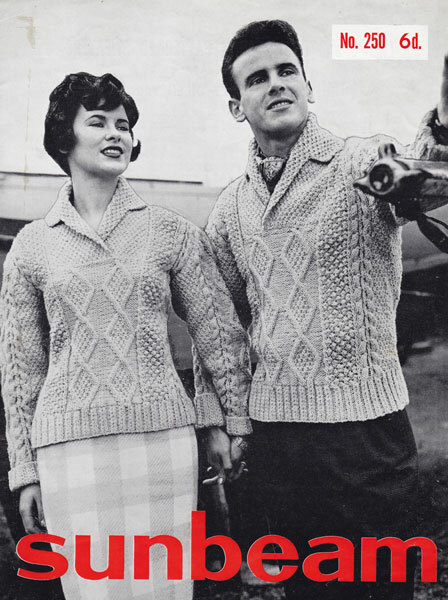 This super pattern has instructions for jumper with or without collar as shown on front and has a super diamond and chain link design. To fit 32, 34, 36, and 38 inch chest. Traditional aran design in a less bulky double knitting yarn Always work a tension square and change needles if needed. 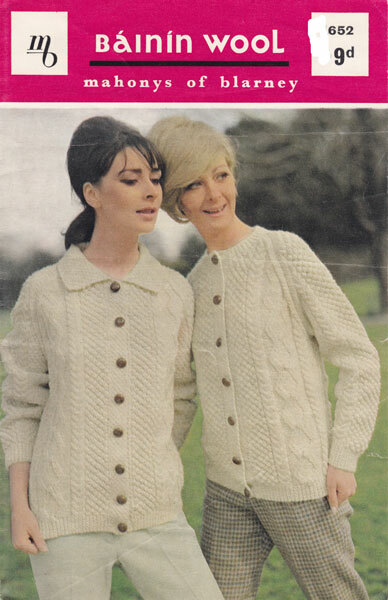 Patons 9516: Vintage ladies aran jacket knitting pattern. With deep collar and pockets with traditonal cables and bobble stitches, chunky buttons, nice for the coming autumn with jeans or slacks. To fit 34-40 inch bust. Always work a tension square. 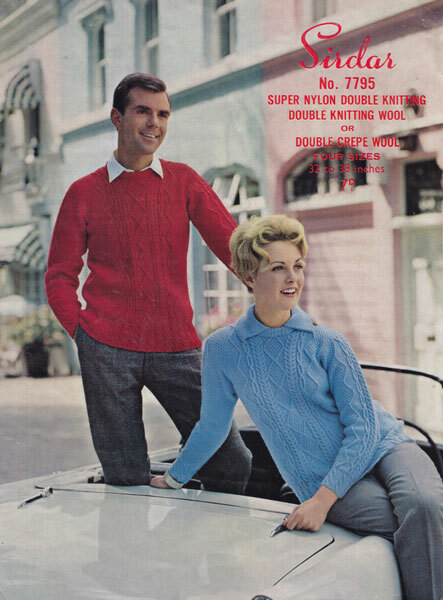 Sunbeam 250: Great vintage aran knitting pattern sweater men ladies 1950s. 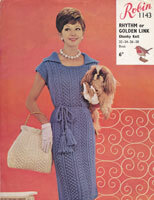 This wonderful retro knitting pattern is in great condition and has instructions for 34-40 inch bust. It is worked in vintage thick aran, which is refered to as 3ply, always work a tension square in the yarn selected then change needles to get the correct size. A modern aran should work just watch the tension, takes between 30-36 oz which is 18-22 50g balls. Crease to centre otherwise in nice condition. 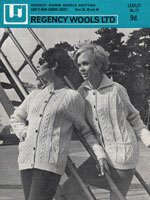 Sunbeam 357: Great vintage ladies cardigan knitting pattern. Knitted in DOUBLE KNITTING which is a bit thicker than ordinary double knitting, but not a bulky aran yarn. Always work a tension square and change needles or yarn to get the correct tension. Sunbeam 531: Great vintage ladies short aran jacket knitting pattern. 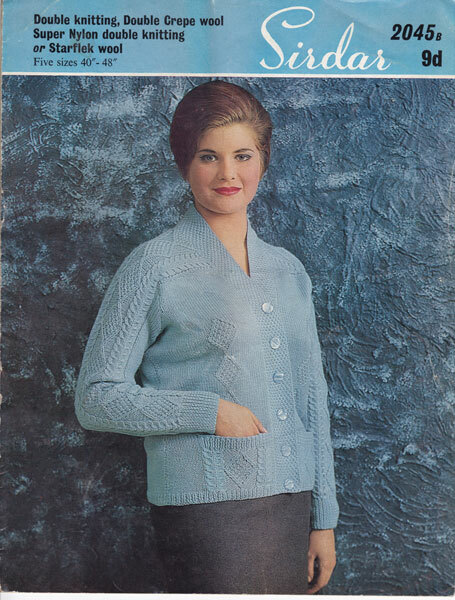 This pattern has instructions for a short jacket with shawl collar and pockets to fit 34, 36, 38, 40 inch bust.Nice intricate cable pattern unusual two button fastening. This one might work better in a double knitting yarn, try a tension square. Pattern in very good condition. 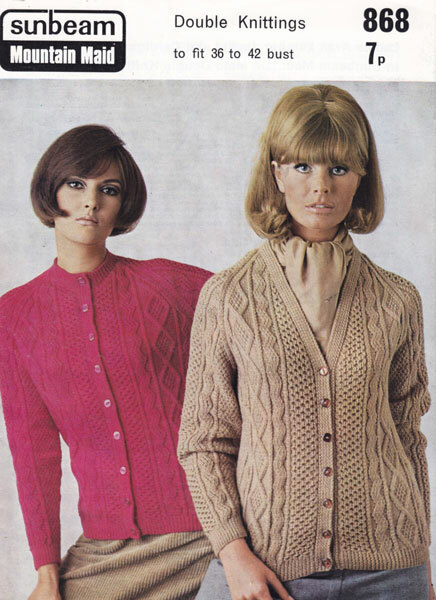 Sunbeam 868: Great vintage ladies cardigans in double knitting with aran design. This pattern has instructions for V neck and button up cardigan to fit 36, 38, 40 and 42 inch bust. Always work a tension square and change needles if needed. 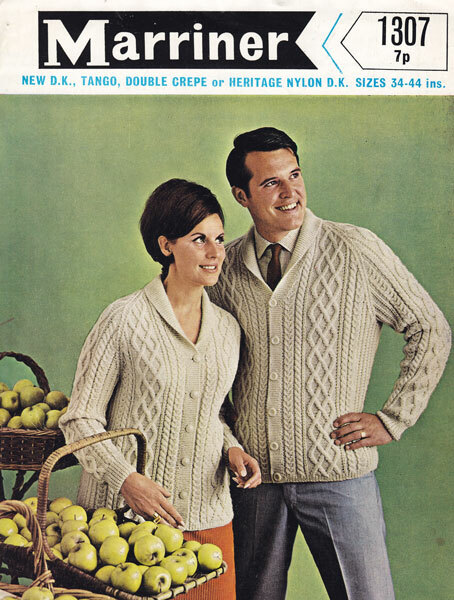 Templetons 1376: Great vintage ladies and men's rich crunchy cable and honeycomb Aran design. Knitted in DOUBLE KNITTING wool to fit 34, 36, 38, 40 and 42 inch bust or chest. Nice classic style but in less bulky DK. Always work a tension square. 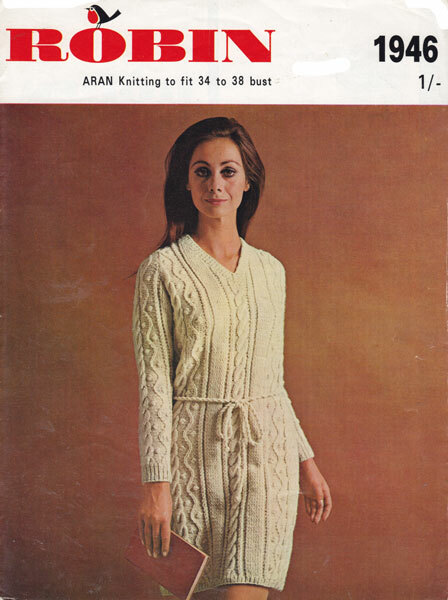 Wendy 404: Great vintatge ladies aran cardigan knitting pattern. 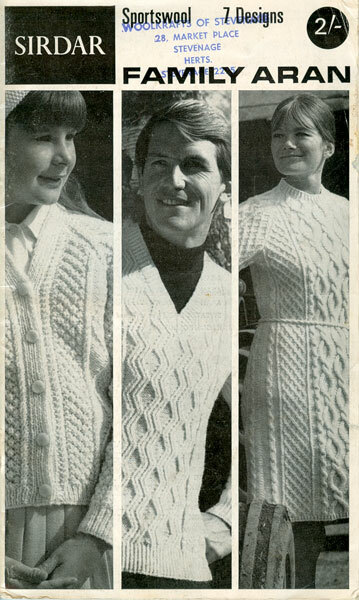 This one is knitted in double knitting with unusual cables that are crips and clear. I love this one and being DK it is not so bulky, but will be warm in the winter. Instructions to fit 34-38 bust in two sizes. Takes 23-25 oz of double knitting wool (14-15 x 50g balls) Always allow a little extra when working vintage patterns. 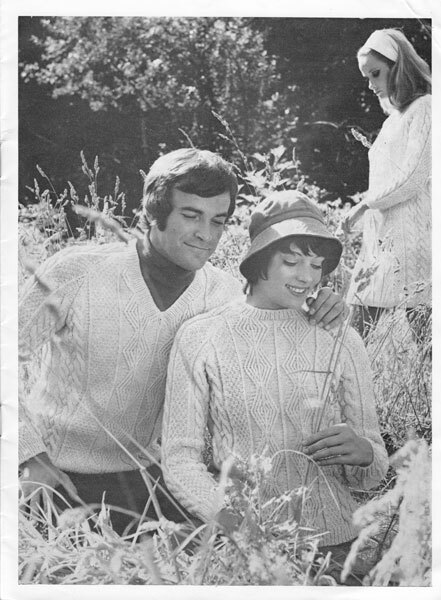 Wendy 589: Aran knitting pattern for him or her, crew neck jumper knitted in double knitting from the 1960's. To fit chest or bust size 34"-44" 23 or 31 1oz balls (1oz is approx 29g) Always knit a tension square. Wendy 673: Great vintage ladies dress and cardigan coat knitting pattern from. Worked in DOUBLE KNITTING with aran design of diamonds. To fit 34, 36 and 38 inch bust. Make coat shorted for jacket, or dress shorter for jumper. A chain belt would also add a bit of glitz to the dress. 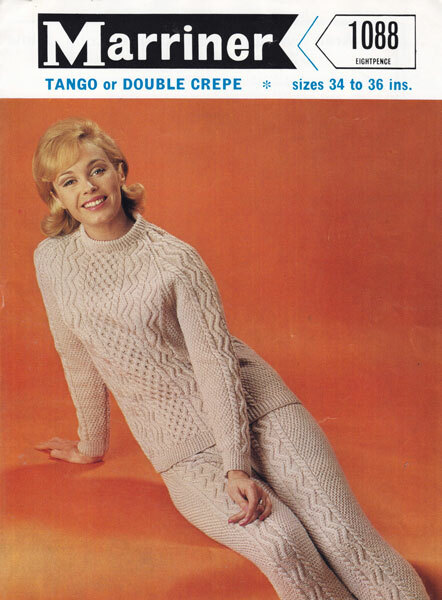 Wendy 834: Great Vintage knitting pattern for Aran style trouser suit. To fit bust 34"/36" knitted in double knitting, 36" hips. Wear something different this Spring. Super skinny leg trousers and snug fitting jacket. Always work a tension square. 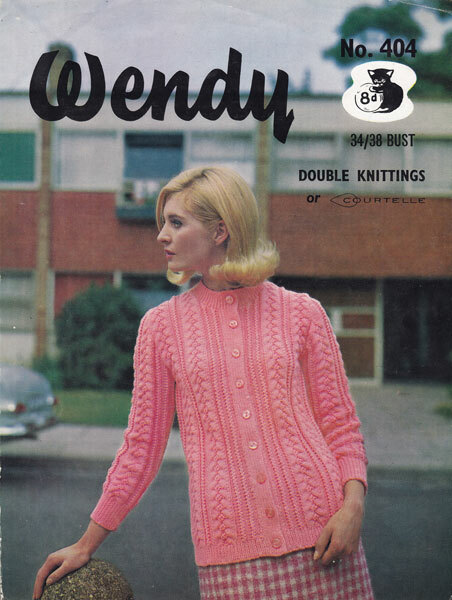 Wendy 946: Great vintage ladies dress and jumper for men. The dress is to fit 34, 36 and 38 inch bust, can shorten so as to make a jumper, and the men's is in sizes 40, 42 and 44 inch chest. 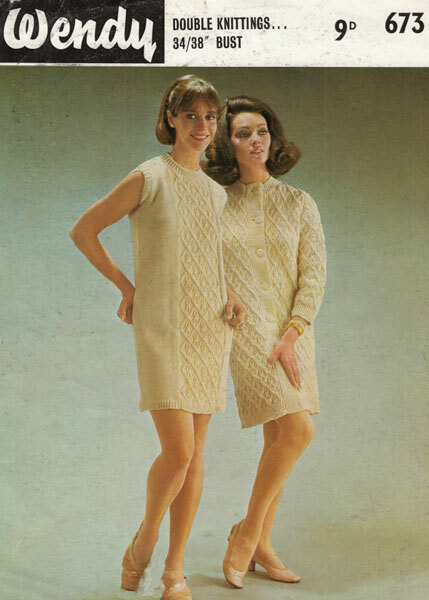 Both are worked in DOUBLE KNITTING wool with Aran design of cables, diamonds and stocking stitch., both have raglan sleeves. Always work a tenison square. Weirside 631: Great vintage ladies aran jumper knitting pattern 1950s. This pattern is for a crew neck jumper with classic half diamonds and centre plaited cable design. Knitted in Aran yarn, always work a tension square and change needles if needed. to fit 30-32, 32-34, 34-36, 36-38 and 38-40 bust/chest. Suitable for man, woman or teenager. 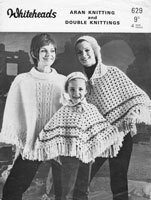 Whitehead 629: Great vintage knitting and crochet pattern for ponchos. aran poncho is knitted with a roll neck. The other style is crocheted as is the beret. Ponchos to fit 32"-38" bust for the aran one and 26"-30 for the crocheted one.